Justin A. Haber provides devoted service to his clients in all aspects of his practice. His primary practice areas include family law, estate planning, real estate, and general litigation. 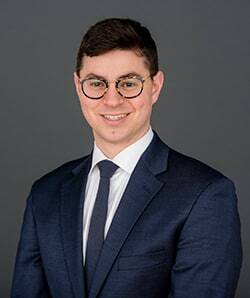 Mr. Haber joined Kalcheim Haber, LLC in 2016 after having begun his career in 2013 with a focus on plaintiff’s personal injury and plaintiff’s civil rights law. In his early career, Mr. Haber established for himself a foundation of litigation experience, including extensive trial advocacy training during his law school education at Chicago-Kent College of Law, where he graduated in the top 10 percent of his class and as a member of the Order of the Coif. Mr. Haber now leverages his litigation background as a means to staunchly advocate for his clients in the courtroom and as a means to identify and avoid potential pitfalls in transactional work. Mr. Haber tirelessly applies his training, experience, and unique perspective to compassionately address the sometimes sensitive issues his clients face.